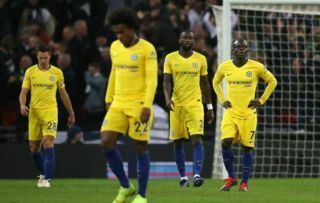 Chelsea winger Willian has said he thinks it’s unfair of fans to boo midfielder Jorginho after his struggles at Stamford Bridge this season. The Brazilian-born Italy international was seen as an exciting signing for Chelsea when he joined from Napoli in the summer, where he looked one of the finest players in Europe in his position under Maurizio Sarri, who joined him in swapping Naples for west London. However, it’s fair to say that, despite a strong start, Jorginho has not always looked convincing in a Chelsea shirt, having been made a pivotal part of the team by manager Sarri. This has also coincided with N’Golo Kante being moved out of his preferred defensive midfield role to a more attacking role, which hasn’t looked a particularly sensible move either by Sarri. Still, Willian has made it clear he doesn’t think his team-mate deserves to be jeered by Chelsea fans as he said that this treatment will only make players feel worse on the pitch. The Brazil international is quoted by Goal’s Nizaar Kinsella as saying: ‘I think this is unfair from them, and of course, I don’t want to talk about this.